In a forum post, I was asked about modifying the code order Variant Trio template to place the main content before the sidebar content. While I am not very convinced of the significance of the code order in terms of how search engines view the site these days, it was a simple modification for me to do. 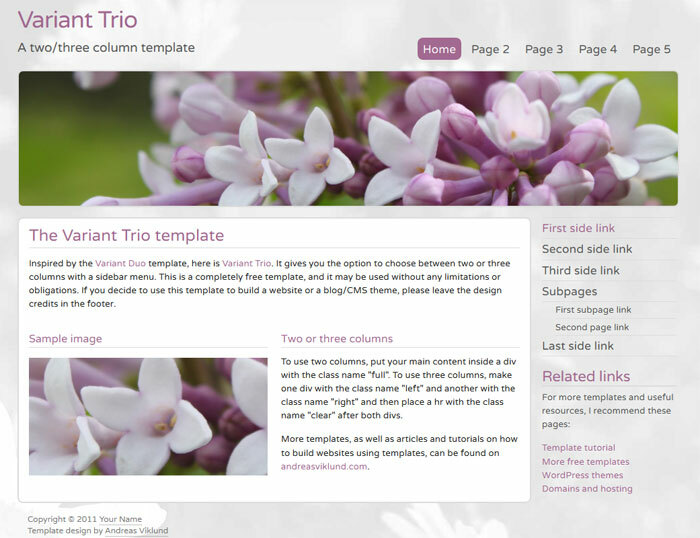 But once I started writing the code, I got a few ideas and the inspiration took over – so instead of just changing the code order I updated the design of the Variant Trio a bit – and here it is as a new download called Variant Trio Alt. It features the reversed content-sidebar code order, a custom font through Google Webfonts, a new header/sample image (straight from the garden outside my house!) and some CSS3 effects like border-radius to make boxes and buttons a bit more visually appealing. I hope that you’ll like it! Click the screenshot below to download Variant Trio Alt, or view a live demo here. This template is just wonderful, really soft. I’m really starting to think about buying one of your themes.